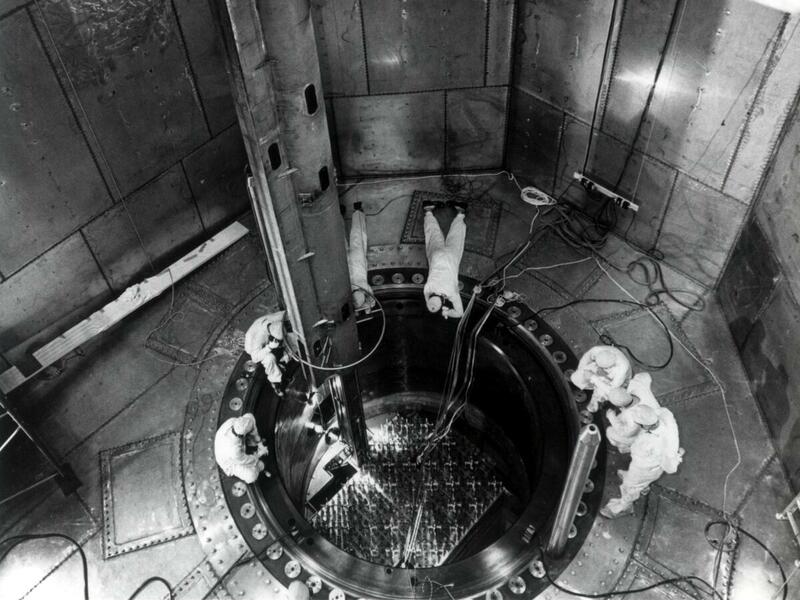 Loading of nuclear fuel in the Fort Calhoun Station's reactor, Unit 1, began in May 1973. As the plant closes the radioactive waste will be stored on site. Brock Lindau has spent most of his career at the Fort Calhoun power plant. He helped install almost $700 million worth of upgrades that got the plant through a flood and a fire, and helped get it licensed to operate until 2033. "I think we're going 100 mph, running perfect, and somehow they just took the wheels out from underneath us, and we're trying to skid to a halt," Lindau says. For all the work Lindau has put into the plant, he's gotten a good income. He and his wife Lisa used some of that money to buy a big house that they love, but they're getting the house ready to sell for when Brock loses his job. "So, today, I have to paint the trim around the windows," Lisa says. "And it's kind of sad, because you think as you're painting, you think a lot, you know — you can't help but think as you paint, that you're painting for the next people." If the Lindaus are perplexed it's understandable. The Fort Calhoun plant cranked out electricity for 43 years, and it was licensed for another 17. Decommissioning will cost up to $1.5 billion, and take up to 60 years to complete. Still, Tim Burke figures eating all of that is cheaper than keeping the plant in production. Burke runs the Omaha Public Power District, which owns Fort Calhoun. He says operating a small plant like this one, especially in a region with abundant wind power and natural gas, just doesn't make sense. "So we have low cost energy, primarily due to increased wind, low cost natural gas, and a lot of capacity in this regional transmission organization," Burke says. Though Burke has many energy options, his customers are not using more power. Across the U.S. demand has been flat for a decade. New capacity drives down the price. 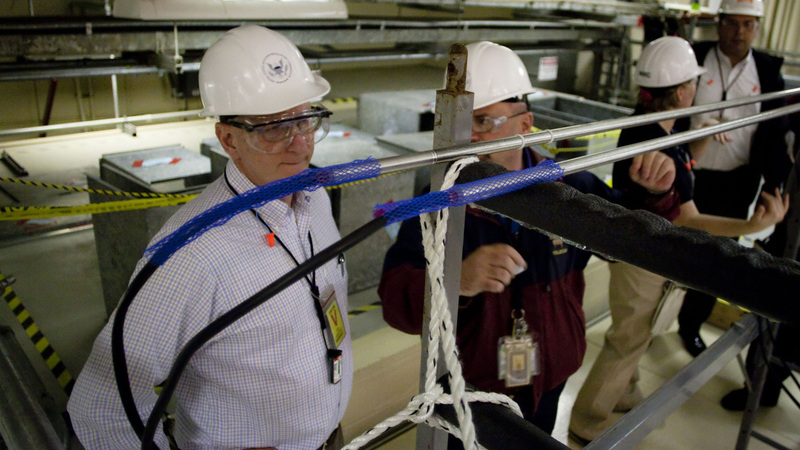 Nuclear power, with its stiff regulations and fixed expenses, can have a hard time competing. "There's certainly accelerated decommissioning. There's a lot more decommissioning than there was say, 10 or 15 years ago," says Allison Macfarlane, a former chairwoman of the Nuclear Regulatory Commission. Macfarlane says it wasn't supposed to be like this. A decade ago, low-carbon nuclear power had a bright future, as a tool to fight climate change. Now, the industry's shrinking. "There are now more plants going offline than coming online," Macfarlane says. Nuclear waste is a big part of nuclear energy and when these plants go offline, something has to be done with it, but what? "Yeah, well, that's an excellent question," Macfarlane says. "It doesn't go anywhere. There isn't any solution for it right now, which is a big problem." The government had a solution: Yucca Mountain in Nevada. Utility ratepayers kicked in $34 billion to develop a long-term storage facility there. But, Christina Simeone, with the Kleinman Center for Energy Policy, says that plan is not going anywhere. After 43 years of cranking out electricity, the Fort Calhoun nuclear power plant is shutting down. The plant was licensed until 2033, but will go offline 17 years earlier than planned. "So, what is happening is plants across the country are having to store waste on site. Every nuclear plant in the country is storing this high level radioactive waste, on site," she says. Simeone says that setup creates a few problems. First, it's dangerous. Nuclear power plants, and de facto waste dumps, sited near water, can spread nuclear waste, and secondly, it's expensive. Waste has to be stored in heavy concrete casks, and guarded. The government's already paid more than $5 billion for that, and Simeone says that figure is likely to mushroom to about $30 billion, minimum, a decade from now. And finally, she says, it's not fair to the communities — like the one around the Fort Calhoun plant in Nebraska — that get stuck with the dangers and financial burdens of nuclear waste, without the high-paying jobs, reliable electric power, and tax benefits of a working nuclear plant.